Upon noticing our large ( both in terms of breadth and height) brick chimney leaning inwards against our roof I started searching for a repair company. 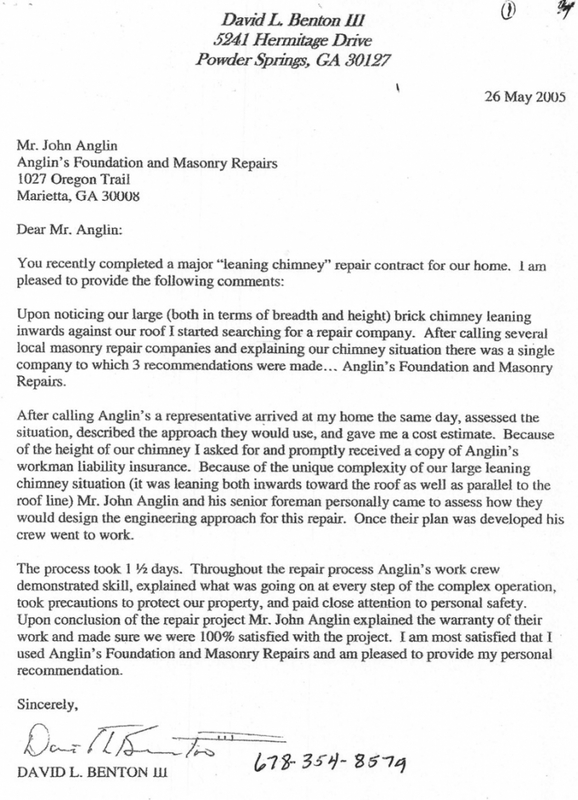 After calling several local masonry repair companies and explaining our chimney situation there was a single company to which 3 recommendations were made ……Anglin’s Foundation and Masonry Repair. After calling Anglin’s a representative arrived at my home the same day, assessed the situation, described the approach they would use, and gave me a cost estimate. Because of the height of our chimney I asked for and promptly received Anglin’s workman liability insurance. Because of the unique complexity of our large leaning chimney situation ( it was leaning both inwards toward the roof as well as parallel to the roof line) Mr. John Anglin and his senior foreman personally came to assess how they would design engineering approach for this repair. Once their plan was developed his crew went to work. The process took 1 ½ days. Throughout the repair process Anglin’s work crew demonstrated skill, explained what was going on at every step of the complex operation, took precautions to protect our property, and paid close attention to personal safety. Upon conclusion of the repair project Mr. John Anglin explained the warranty of their work and made sure we were 100% satisfied with the project. I am most satisfied that I used Anglin’s Foundation and Masonry Repairs and am pleased to provide personal recommendation.